Financial planning for retirement generally receives less attention from individuals than might be considered wise. 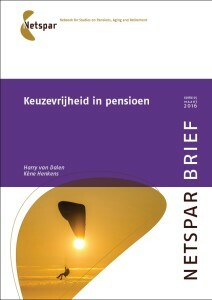 A large gap also exists between the knowledge and expertise of the providers of pension products and their clients. For the areas where a “fiduciary duty” already exists as a legal obligation, Netspar has examined what a “desirable” variant of this duty might be. The objective of the fiduciary duty should be to allow individuals to make decisions in their own best interests and, in any event, help them avoid poor decisions. The most important dynamics in implementing this fiduciary duty are the provision of information and communication with the individual, along with the design of the decision-making process. There is and has done the necessary research on fiduciary duty and (financial ) communication and literacy. For questions related to the Communications and Fiduciary Duty theme, please contact program coordinator Arthur van Soest.